Take a look at these pictures. They are not new pictures, but symbolize why I am deeply involved in the Sderot Hesder. In the first picture you have two student/soldiers side by side listening to a shiur. The first kid (and I say kid cause he is only around 19 years old) is taking a break on active duty, and is still in uniform, while the second is currently learning at the Hesder. That's what this is all about - Torah, Israel, serving your country, education etc. That's why the Hesder is so important. 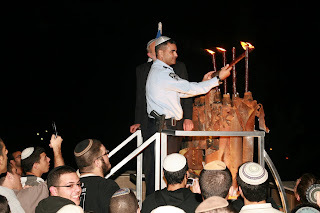 In the second picture you have the chief of the Sderot police lighting a menorah this past Hanukkah. The menorah itself is made entirely out of the Kassam rockets which the Arabs fired into Sderot. Over 10,000 rockets and counting have landed in Sderot since the year 2001. Lighting a Menorah which was made in Gaza is in essence "giving the middle finger" to those who launch rockets at Jewish children going to school. You launch these crude rockets and we'll sanctify them into something holy and fill them with oil and do a mitzvah. Then we'll put that menorah on one of the highest points in the whole city so you can see that WE WILL NOT BE DETERRED! Let's not forget that in addition, over 5,000 rockets were launched at Gush Katif before it was made Judenrein back in 2005. Yes, I am purposely using that harsh term, because that is what happened. We didn't disengage, we still supply Hamas with electricity, humanitarian aide etc. etc. WE PULLED GOOD PEOPLE OUT OF THEIR HOMES AND ONLY GOT TERROR IN RETURN. And where are these people now? Most are living in couped up caravans with no permanent solutions in sight. The government says everyone will be re-settled by 2011, but I know first hand from reliable sources that that is impossible. More on Gush Katif at another time.